All Christendom ought to feel joyful and make great celebrations and give solemn thanks to the Holy Trinity with many solemn prayers for the great exaltation which it will have, in the turning of so many people to our holy faith, and afterwards for material benefits, since not only Spain but all Christians will hence have refreshment and profit. These people are very unskilled in arms… with 50 men they could all be subjected and made to do all that one wished. 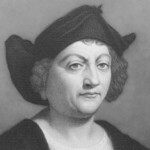 Christopher Columbus was born in Genoa, Italy. He was an Italian explorer and navigator. Under the auspices of the Catholic Monarchs of Spain, he completed four voyages across the Atlantic Ocean. Those voyages, and his efforts to establish permanent settlements on the island of Hispaniola, initiated the Spanish colonization of the New World.